The finding of a new cannon! 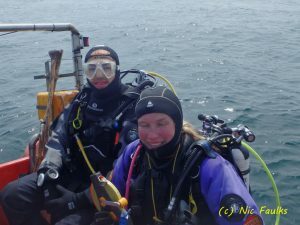 Three whole days of diving organised for the late May bank holiday; with at least one dive a day on Gun Rocks. Time to get the new marker buoy in and to remap the cannon and if time permits, to start the photogrammetry of the cannon left to do…. Saturday 27th dawned so bright and sunny. With five on the boat, we set off early, as this was a weekend of springy springs. First dive was on the Crumstone, which was scenic and relaxing. The second dives were on Gun Rocks. Cleaning off cannon 6001 ready to photograph, and remapping the cannon. 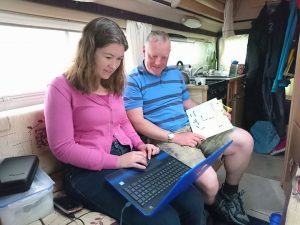 Unfortunately Nic didn’t manage to map much and ended up directionally confused; however she was ecstatically happy to find an octopus’ layer, with resident, adjacent to cannon 6001. Si completed his mission, to anchor the new buoy to mark the start of the dive trail and show Richard where all of the cannon are. Sunday 28th wasn’t so sunny, but was a day of frenetic activity! 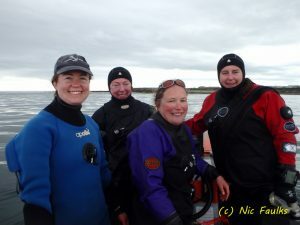 The first dive was on the north side of inner sound, for Becky, Nic and Lindsay. Lots of critters to photograph. We then headed over to Gun Rocks, where Si and Peta managed to measure and take bearings of all thirteen of the cannon. This was done so that we could realign and check the mapping provided by Wessex, as we always felt that it just wasn’t quite right. Nic, Becky and Lindsay then went down and Becky took wildlife photos for this website, Lindsay took some film footage and Nic cleaned up cannon number 6001 for photographing on Monday. By the evening, Si and Peta had drawn up a new improved map of the Gun Rocks cannon, finally we have something that we are happy to put into production! Monday 29th started a bit cloudy, but the sea was flat calm. We headed straight out to Gun Rocks to dive the Staple Island side. 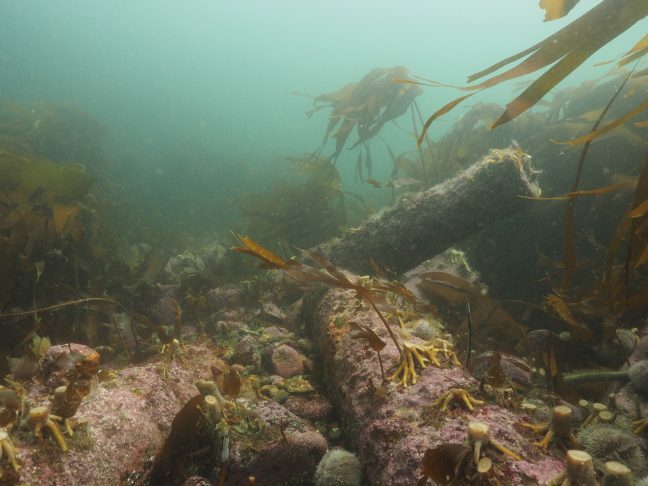 Si dived for a full 45 minutes in 4-6 metres of water looking for the mythical cannon which lies on this side of the rocks, but unfortunately after battling with kelp never managed to find it…. though he did find one later! Nic and Peta then went down on to the main site, Nic took 200+ photos of cannon 6001 for photogrammetry and Peta continued to measure and record all of the cannon. Success, all done…. then as we headed to the surface Peta lost the dive slate with the measurements on… oh no! Si then jumped in with his scuba kit on. He didn’t find the dive slate, but what he did find was the 14th cannon! It lies on the edge of the Gun Rocks plateau, just above the drop into Staple Sound. It has a very clean round trunnion; you almost feel like it should display a clear ‘F’ or some other symbol. Si took some photos of his find. Discussions now centre upon whether we should be including this new cannon in the dive trail, as it may lead people out and in to the sound, which can only be dived on slack….. The location of this cannon, does however increase the likelihood that the cannon on the Gun Rocks plateau are more likely to be from the same wreck as those in Staple Sound. The finding of cannon 14 means that the two groups of cannon are now only separated by approximately 15-20 metres. The funding is now in place but then there are the licences. Yes, we need a Marine Management Organisation (MMO) licence to “deposit” rope in the sea bed. So I have been in consultation with some nice people at the MMO, one is even a diver himself, who have advised me which licence to go for…. Its called a “Fast Track Licence” which takes 13 weeks to process. Ironically the normal licence also takes 13 weeks, but there is a price difference. The Fast Track only costs marginally more than the cost of putting the trail in, the normal one, costs a lot more. So fingers crossed that it is a smooth process. 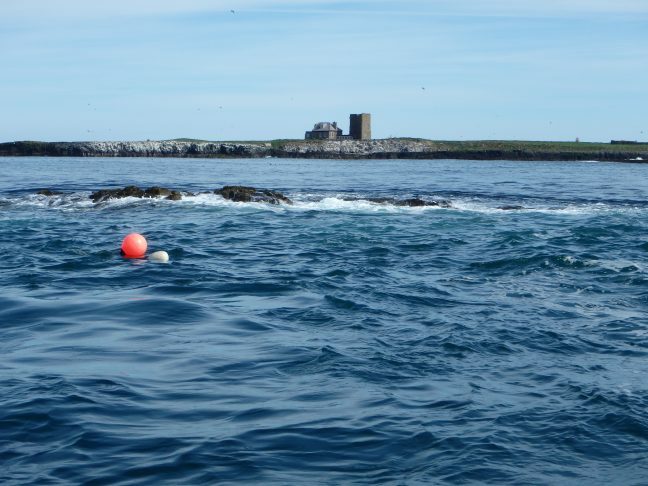 We are hoping to be out on Gun Rocks over the Bank Holiday weekend, this is to put the navigation or start marker buoy in (we can do this under the 28 day temporary buoy rule, no MMO licence required). We will also be more accurately locating the cannon for the map using measuring tapes and a compass. If any one would like to help then please let me know. The trail work has started! We now have the official go ahead letter from the Heritage Lottery Fund. Although we knew we had secured funding back at the end of March, we were not given the official nod, allowing us to start work until near the end of April. So far, three days of diving has been undertaken on Gun Rocks. (Two further days lost to the weather). 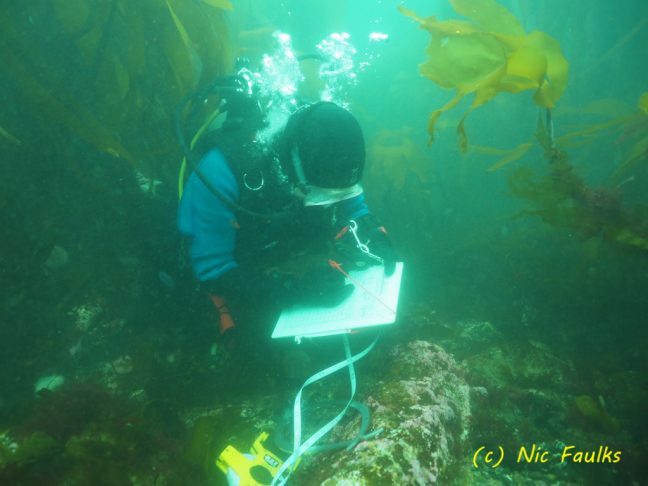 The trail has been cleared of kelp and the cannon located – all 13 of them. However the Wessex Archaeology derived map isn’t looking as accurate as we first thought, so we are hoping to remedy this on the late May Bank Holiday Weekend. The discussion now is whether we put a rope on the trail, or just buoy a few of the cannon and hope that divers can use a map to navigate around to each of the cannon. The rope would make it easy, but the map and buoy approach would be more fun… I guess the best way to find out which works best is to have some divers come and visit to try out the trail (both with and without a rope) and let us know what they think. I am also currently trying to track down someone at the Marine Management Organisation in Newcastle to talk to to clarify whether we need a licence to buoy the start of the trail, and to put in a rope trail (if we do). All licences cost money and take time. If Gun Rocks was a protected wreck, then we wouldn’t need an MMO licence. At least we can temporarily mark the start of the trail (28 days) without the need for a licence, so the process shouldn’t hold us up, or the project suffer. In other news, Joe Mallon has been doing a lot of research for this project. Hopefully I can meet up with him this month to see what we can put on the website for all to see. 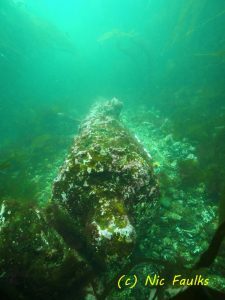 It sounds as if he has made some quite exciting finds, some which may shed light on the origins of the wreck(s) which deposited the cannon. So it is all go at the moment. Sometimes I feel that there are not enough hours in the day!